These Robust features of DISQUS is the reason why many Bloggers and Webmasters are moving to Disqus, and the Great news is you won't Loose previous Comments saved in your Blogger blogs, you can pack all the comments along too and continue using those Comments with Disqus on your blog after moving them from Blogger or WordPress. So if you wanna join the Band, this is a Fresh tutorial that works on How to Import Your Blogger comments Into Disqus system. IN OLD MODERATION VIEW >>> CLICK ON "TOOLS"
3. 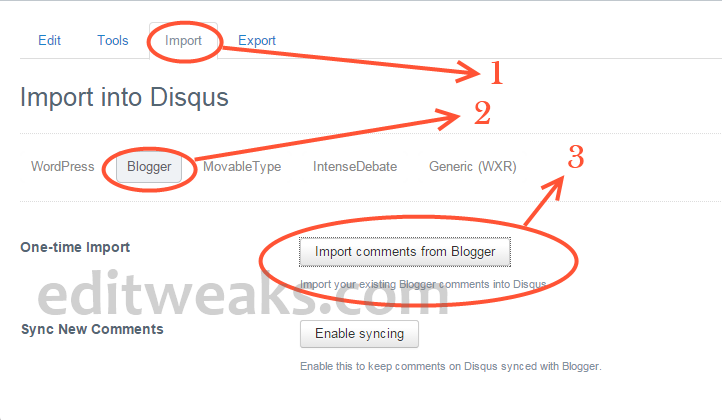 Click "IMPORT COMMENTS FROM BLOGGER"
Next, a new page will Open asking For Permission from your Account, all you need do is , Click on Allow to authenticate the Disqus to process and start Importing Comments from your Blogger Blog. After seconds, you will get something Like this Message Below. Meaning, it will take at least 24 Hours to Finish Importing, depending on the Load of Comments in your Blog. I used it on my second blog and all Comments were Imported in few minutes because I don't have much comments there. Hope this post Solved your issues. If you still face any difficulties with Disqus, let us know by commenting Below. Thanks for reading. Wow. I never knew that we could import our comments from blogger to disqus. Though I have used disqus for some while but stopped using it, due to the already indexed blogger comments I have. DISQUS loads on my Mobile phone (Opera mini), although it depends on the browser. you use.